Joel Allison is chief executive officer of Baylor Scott & White Health, a fully integrated healthcare system headquartered in Dallas, Texas providing services to a network of acute care hospitals and related healthcare entities that provide patient care, medical education, research and community service. His primary responsibility is to help Baylor Scott & White attain its vision “to be the most trusted name in giving and receiving safe, quality, compassionate health care.” Mr. Allison’s career includes more than four decades in health care management. 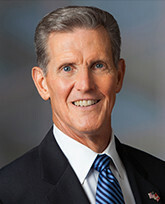 He joined Baylor Health Care System in 1993 and served as Baylor’s senior executive vice president and chief operating officer before being promoted to president and CEO in 2000. On October 1, 2013, he was named Chief Executive Officer of Baylor Scott & White Health. Mr. Allison is a Fellow of the American College of Healthcare Executives. Nationally, he serves on the Healthcare Leadership Council and the United Surgical Partners, International board. In addition, he has been appointed by Governor Rick Perry to serve on the Texas Institute of Health Care Quality and Efficiency Board and is involved in many other state and local organizations, including the Texas Association of Voluntary Hospitals, Texas Care Alliance, Baylor University Board of Regents, Dallas Citizens Council and the Denison Forum on Truth and Culture. He is also a past chairman of the United Way of Metropolitan Dallas Board, the Dallas Regional Chamber Board and the Dallas Citizens Council Board. Mr. Allison has received numerous recognitions during his career for his outstanding leadership and commitment to the healthcare field. Mr. Allison received a bachelor’s degree in journalism and religion from Baylor University in 1970, a master’s degree in health care administration from Trinity University in 1973 and is a graduate of the Harvard Business School Advanced Management Program. Today, through his leadership role with BSWH, Allison continues to fulfill his life-long mission to help lead an organization that combines ministry and health care in its mission statement and day-to-day operations. Joel and his wife Diane have a daughter, two sons and six grandchildren.